Three main preventive principles against milk fever were evaluated in this literature review, and the efficacy of each principle was estimated from the results of controlled investigations. Oral calcium drenching around calving apparently has a mean efficacy of 50%–60% in terms of milk fever prevention as well as prevention of milk fever relapse after intravenous treatment with calcium solutions. However, some drenches have been shown to cause lesions in the forestomacs. When using the DCAD (dietary cation-anion difference) principle, feeding rations with a negative DCAD (measured as (Na + K) – (Cl + S)) significantly reduce the milk fever incidence. Calculating the relative risk (RR) of developing milk fever from controlled experiments results in a mean RR between 0.19 and 0.35 when rations with a negative versus positive DCAD are compared. The main drawback from the DCAD principle is a palatability problem. The principle of feeding rations low in calcium is highly efficient in milk fever prevention provided the calcium intake in the dry period is kept below 20 g per day. Calculating the relative risk (RR) of developing milk fever from controlled experiments results in a very low mean RR (between 0 and 0.20) (daily calcium intake below versus above 20 g/d). The main problem in implementing the low-Ca principle is difficulties in formulating rations sufficiently low in calcium when using commonly available feeds. The use of large doses of vitamin D metabolites and analogues for milk fever prevention is controversial. Due to toxicity problems and an almost total lack of recent studies on the subject this principle is not described in detail. A few management related issues were discussed briefly, and the following conclusions were made: It is important to supply the periparturient cow with sufficient magnesium to fulfil its needs, and to prevent the dry cows from being too fat. Available information on the influence of carbohydrate intake, and on the effect of the length of the dry period and prepartum milking, is at present insufficient to include these factors in control programmes. Principper for kontrol af mælkefeber. En litteraturoversigt. I dette review blev 3 hyppigt anvendte forebyggende principper mod mælkefeber gennemgået: Oral calcium tildeling i tiden omkring kælvning, tildeling af forsurende rationer (DCAD = dietary cation-anion difference) samt tildeling af rationer med lavt calciumindhold i goldperioden. Effektiviteten af hvert princip blev estimeret ud fra resultaterne af kontrollerede forsøg. Oral calcium tildeling i tiden omkring kælvning har tilsyneladende en effektivitet omkring 50%-60%, hvad angår forebyggelse af mælkefeber såvel som forebyggelse af tilbagefald efter i.v. behandling med calciumpræparater. Forsøg har vist, at visse af præparaterne har bivirkninger i form af læsioner i formaverne. Betydningen af disse læsioner er endnu ikke undersøgt. Ved anvendelse af forsurende rationer i goldperioden vil rationer med DCAD (beregnet som (Na + K) – (S + Cl)) under 0 sænke mælkefeberincidencen signifikant. Udfra de kontrollerede forsøg inkluderet i dette review er den relative risiko (RR) for af udvikle mælkefeber blandt køer fodret med rationer med DCAD < 0 i forhold til køer fodret med rationer med DCAD>0 estimeret til at ligge mellem 0.19 og 0.35. Dog varierer mælkefeberincidencen voldsomt (0%- 80%) blandt køer fodret med rationer med positiv DCAD. Det primære problem forbundet med anvendelsen af DCAD princippet er smagelighedsproblemerne. Tildeling af goldrationer med lavt calciumindhold er meget effektivt til forebyggelse af mælkefeber, forudsat det daglige calciumindtag ikke overstiger 20g/d i goldperioden. Blandt de i reviewet inkluderede undersøgelser var den relative risiko for udvikling af mælkefeber blandt køer med dagligt Ca-indtag under 20g/d i forhold til køer med dagligt Ca-indtag over 20g/d estimeret til at ligge mellem 0 og 0.2. Dog var mælkefeberincidencen stærkt varierende blandt køer med dagligt Ca-indtag over 20g/d (0%-80%). Problemet forbundet med implementering af Lav-Ca princippet er, at de hyppigst anvendte fodermidler til kvæg har et højt indhold af calcium, hvilket gør det vanskeligt at formulere rationer med tilstrækkeligt lavt calciumindhold. Anvendelse af vitamin D samt vitamin D metabolitter og analoger til forebyggelse af mælkefeber er på grund af toxicitetsproblemer samt mangel på nyere undersøgelser kun behandlet kort i dette review. Ud over de ovennævnte forebyggelsesprincipper blev enkelte managementrelaterede emner med relation til mælkefeberforebyggelse diskuteret, og følgende konklusioner blev draget: Det er vigtigt at tildele den drægtige goldko tilstrækkeligt med magnesium samt at undgå, at goldkøerne bliver for fede. Tilgængelige informationer vedrørende betydningen af kulhydratindtaget, længden af goldperioden og malkning inden kælvning for udviklingen af mælkefeber er for utilstrækkelige til, at disse faktorer på nuværende tidspunkt kan inkluderes i mælkefeberkontrolprogrammer. Milk fever (paresis puerperalis), the clinical manifestation of parturient hypocalcaemia, is a disease of considerable importance for dairy cow welfare and economy. Although treatment with intravenous infusion of calcium salt solutions cure most clinical cases of hypocalcaemia, such cows are later more susceptible to other metabolic and infectious diseases [25, 24]. In many countries prevention of parturient hypocalcaemia is therefore given a high priority. It has been proposed that a specific control program is relevant when the incidence of milk fever increases to above 10% among high-risk cows, i.e. cows entering third or later lactations . Oral drenching around calving with a supplement of easily absorbed calcium. The feeding of acidifying rations by anionic salt supplementation during the last weeks of pregnancy. Feeding low calcium rations during the last weeks of pregnancy. Prepartum administration of vitamin D, vitamin D metabolites and analogues. Dietary magnesium level control peripartum. Controlling dietary carbohydrate intake peripartum. Shortening of the dry period. Reduced milking in early lactation. The purpose of this review is to give an overview of the various control principles. Three (I-III) of the most widely used control principles will be discussed in detail. The use of vitamin D administration (IV) and the less specific control measures (V-X) will be addressed more briefly in the present review, which primarily focuses on controlled studies. There are many formulations available on the European and the US market for oral calcium drenching. The majority of studies documenting their effect have been done with preparations containing easily absorbed calcium salts such as calcium chloride, providing 40–50 g of calcium per dose as a bolus, a gel, a paste or a liquid (Table 1). Most producers recommend prophylactic programmes involving 4 doses. Oral calcium drenching is also recommended as a supplement to intravenous therapy for the prevention of milk fever relapses (Table 2). In this case a programme involving 1 or 2 doses is most often recommended. Controlled investigations on the prophylactic effect of oral calcium drenching on milk fever. Preventive effect calculated as percentage reduction in milk fever incidence among treated cows as compared to controls. Increased salivation following administration of the paste. 1) Preventive effect = 1 - RR = 1 - (incidence rate of milk fever among experimental cows/incidence rate of milk fever among control cows). Controlled investigations on the prophylactic effect of oral calcium drenching supplementary to i.v. treatment on milk fever recurrence. Preventive effect was calculated as percentage reduction in milk fever recurrence among orally supplemented cows as compared to controls. No apparent side-effects. Two different types of i.v. treatment were used. Different types of i.v. treatments in the two experiments (a and b). The amount of calcium given p.o. depended on the size of the cow. Within each experiment (a and b) 4 different types of i.v. treatments were used. 1) Preventive effect = 1 - RR = 1 - (incidence rate of milk fever recurrence among experimental cows/incidence rate of milk fever recurrence among control cows). 2) The Ca dose was calculated based on information about the CaCl2 dose. The principle was originally developed for therapeutic use in cows with milk fever, as an alternative to intravenous calcium infusions . A handful of calcium chloride was dissolved in a bucket of water and given by stomach tube. However, as discussed below, such calcium chloride drenchings were later discovered to have a prophylactic effect also, when given according to a programme covering the peak of the risk period. Oral calcium drenching should preferably provide free (ionised) calcium, because this form is most quickly absorbed from the rumen and abomasum. Normally cows absorb calcium by 2 mechanisms: active transport across intestinal epithelial cells and passive transport between intestinal epithelial cells . Passive transport is dependent on diffusion down a concentration gradient, and passive diffusion of Ca from the lumen of the gut to the extracellular fluids occurs when the luminal ionised Ca concentration exceeds 1 mM . Oral calcium treatment presumably increases luminal Ca concentration above 1 mM, favouring passive transport of Ca into the extra cellular fluids . The capacity of the passive transport of Ca is in principle unlimited and independent of stimulation by 1.25-dihydroxyvitamin D. Thus, the net absorption of free Ca increases linearly with increasing luminal Ca concentrations . Increasing the amount and the number of drenchings with calcium compounds providing free calcium ions therefore quickly increases the amount of calcium ions absorbed into the bloodstream. Supplying the cow with CaCl2 salts may furthermore, due to the osmotic effect, stimulate the oesophageal groove reflex, permitting rumen bypass. The calcium solution thereby avoids dilution within the rumen, and a high concentration gradient would be obtained in the abomasum favouring passive Ca transport . The calcium absorption was studied by  by giving a calcium chloride gel product within 1 h of parturition. A significant (p < 0.01) rise in serum total calcium was recorded within 5 min of administration. Serum calcium levels had returned to baseline values after 24 h. Thus a significant increase in serum Ca can be obtained very quickly. On the other hand, the biological effect is short-lived, which explains the risk of recurrence. discussed the short effect and believed it to be the result of an inhibition of the activation of those homeostatic mechanisms that should otherwise protect against parturient hypocalcaemia. Chalk (calcium carbonate) does not provide readily absorbable calcium ions . It most likely needs exposure to the acid in gastric juice to be dissociated and such calcium is therefore primarily available for absorption in the small intestine. The digestibility of such bound calcium is therefore dependent on the calcium absorption capacity of the small intestine. This capacity is controlled by the calcium homeostatic mechanisms, which, in case of the milk fever cow, are operating at an insufficient level. Simply increasing chalk supplementation to calving cows, or drenching them with such substances, is therefore unreliable in preventing milk fever. Accordingly recent studies  have shown that milk fever was not prevented in control cows drenched with calcium carbonate after calving. Table 1 shows the preventive effect calculated from controlled investigations on oral calcium drenching against parturient hypocalcaemia. The preventive effect is calculated as 1 minus the relative risk (RR), where RR is the incidence rate of milk fever among cows in the experimental group divided by the incidence rate of milk fever among cows in the control group. In the majority of these investigations the material used are either cows, which had milk fever at the previous calving, or cows of third or higher parity. A frequency of milk fever at 20%–50% may be expected among such cows . In the trials of [60, 99] and  the programme of giving 3–10 doses of calcium chloride as a water-soluble gel has a preventive effect of approximately 50%–55%. The early study of  is given less weight because essential details for efficacy estimation were not well described. According to  drenching with 4 doses of CaCl2/CaSO4 in capsules seems to have slightly higher efficacy (73%). Calcium chloride in a paste formulation was reported to have a preventive effect of about 70% in 2 investigations [3, 2], and calcium as a propionate paste was tested in 1 study with an efficacy of 42% . A propionate bolus product was similarly reported in a single study, with an efficacy of 30% . The preventive effect of 2 doses, a widely used practice, has apparently not been investigated. The limitation of using the above mentioned compounds for oral Ca drenching is the toxicity, as discussed below. Table 2 shows the preventive effect calculated from controlled investigations on oral calcium drenching supplementary to i.v. treatment of milk fever cases. These investigations are therefore concerned with the risk of clinical relapse in cows already treated by the veterinarian with intravenous calcium infusion. In an average cow population, the recurrence rate after 1st treatment is of the order of 30%–35% without supplementary oral treatment . In particular aged cows can be very hard to get on their feet, and the recurrence rate may be considerably higher, as in the study of  (see Table 2). In summing up the figures presented in Table 2, the mean preventive effect of such a post treatment drenching regime involving 1 or 2 oral doses against milk fever, recurrence may be assessed at approximately 60%. Some dairy managers apply oral calcium drenching for a third purpose, i.e. for the tactical or preventive treatment of newly calved cows that appear to be borderline cases of milk fever. The early study of  support the conviction of many herd managers that such use is effective, but controlled studies are lacking. Because of potentially decreased swallowing reflex and rumen motility in cows with borderline milk fever oral calcium drenching should be done with caution. Positive side effects following efficient milk fever prevention are reductions in hypocalcaemia-associated diseases and improved reproduction and production, as reviewed by . Unwanted side effects following calcium chloride drenching were observed by  and later by . These side effects appeared when preparations containing calcium chloride in a concentrated form was used, and they were caused by a strong irritating effect on the mucous lining of the gastro-intestinal tract. Post mortem lesions vary in severity from focal haemorrhage to deep necrosis. Particularly severe lesions were seen after drenching with a commercial product based on calcium formate . Preparations containing calcium chloride in oil emulsions appear to be less harmful than preparations containing calcium chloride in aqueous gel or plain aqueous solution [62, 116], and the relatively low efficacy of propionate preparations should be weighed against the absence of reports on unwanted side effects after drenching with calcium propionate. The significance of most of the lesions in terms of cow welfare and production is frequently debated, but has not yet been investigated. The chloride ion from CaCl2 is readily absorbed into the blood, and blood pH therefore decreases to maintain electroneutrality of the blood . Besides the caustic effect on the mucous lining overdosing with calcium chloride preparations may therefore result in uncompensated systemic acidosis. Fatal cases due to application errors involving pharynx penetration, or lung aspiration of liquid products, are well known in practice but seldom reported in the literature . Oral drenching with calcium preparations can prevent a significant proportion of milk fever cases when given to parturient cows. Most documented preventive programmes involve administration of 3–4 doses distributed evenly during the period from 12–24 h before calving to 24 h after calving [60, 82, 42, 75, 3]. Oral calcium drenching can also prevent a significant proportion of relapses when given as a 1 or 2-dose supplement to intravenous calcium therapy of milk fever cases. General drawbacks of oral drenching are that single cow handling is necessary, and that there is a risk of aspiration pneumonia. As mentioned above, products based on calcium chloride (and calcium formate) may give rise to irritation of the gastrointestinal mucosa and uncompensated systemic acidosis. Under practical conditions this principle is applied by supplementing the dry cow ration with an anionic salt, or more common a mixture of salts, capable of acidifying the cow. The required amount of anionic salts is dependent on the DCAD of the prepartum ration, and it may, depending on the salt, range from around 50 to 500 g . Although the time period of feeding the salts has ranged from 21 to 45 days in most studies, it may be possible to reduce the time period without loosing the effect. It is suggested, however, that a feeding period of at least 10 days prepartum is required . This principle, and the theories behind it, has been well described by others [30, 27, 102, 41, 114, 36, 52]. The cow must be brought into a physiological stage of compensated systemic acidosis. This is most efficiently achieved by the ingestion of rations having a surplus of acidifying anions. A useful method for determining whether an animal is responding to added dietary anions is to monitor urine pH. A urinary pH within the range 5.5 to 6.2 is accepted as an indicator of successful administration of anions . The equation most often used by dairy nutritionists is, however, the one considering (Na + K) - (Cl + S) . During the years studies have been performed using a wide variety of anion sources (i.e. MgSO4, MgCl2, NH4Cl, (NH4)2SO4, CaCl2, CaSO4, HCl, H2SO4, AlSO4). The mechanism by which the acidotic stage affects calcium metabolism and homeostasis is not fully understood, but it is suggested that the effect is mediated via an enhancement of the stimulatory effects of PTH . Increased plasma hydroxyproline concentration suggests that bone resorption may be involved , and some studies reported an increase in the apparent calcium absorption from the digestive tract [113, 69], while others found no changes , or even a decrease . The extensive urinary calcium excretion seen in cows fed anionic salts, may stimulate the vitamin D-related calcium homeostatic mechanisms, and in this way help prevent parturient paresis . Fig. 1 shows the incidence of milk fever obtained in experiments applying feed with different DCAD. Only studies in which the DCAD has been calculated by the formula (Na+ + K+)-(Cl- + S--) is included. Looking at the distribution of the milk fever incidence in relation to the DCAD there is a clear tendency towards increasing milk fever incidence with increasing DCAD. As can be seen, keeping DCAD below zero results in a reduced milk fever incidence compared to a positive DCAD. The milk fever incidence varies significantly, ranging from 0 to 80 percent when the DCAD is positive, whereas the incidence appears to stay below 20 percent when the DCAD is negative. It appears from the figure, that the effect is unpredictable based solely on the absolute size in DCAD change, and that the effect apparently depends on whether the DCAD is kept below a certain limit. As a rule-of-thumb this limit is at zero. The influence of dietary cation-anion difference (DCAD) in the dry cow diet on the incidence of milk fever. Results from 11 studies. 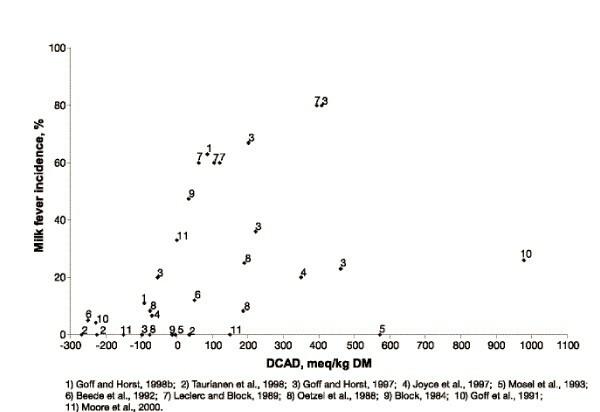 Calculating the relative risk (RR) of developing milk fever in each experiment including groups receiving feeds with DCAD below and above (or equal to) zero, results in a mean RR of approximately 0.35 in favour of the negative DCAD. In studies including more than 2 groups, the milk fever incidence rate among positive DCAD versus negative DCAD groups is used for calculating the RR. The study done by  is not included in the calculations, as they did not include a group receiving feed with a negative DCAD. In 2 of the studies  and  the milk fever incidence was zero among cows in the positive as well as negative DCAD group (RR = 1). Excluding these results from the calculations, the RR changes from 0.35 to 0.19. The true RR is probably to be found somewhere in between. It should be noted, that Fig. 1 is based solely on the results obtained in 11 studies, and because of this it only represents a limited number of animals. Furthermore, the experimental conditions (diet, number of cows, parity, duration, previous cases of milk fever etc.) vary considerably between the different studies. For instance some studies included cows of second or first parity [73, 107, 70], whereas others [10, 79, 67, 41, 8, 36, 37, 39] only included "high risk" cows (≥ third parity). The interpretation of Fig. 1 should therefore be done with caution. Regarding the optimal amount of dietary calcium in combination with a low DCAD, recommendations are conflicting. 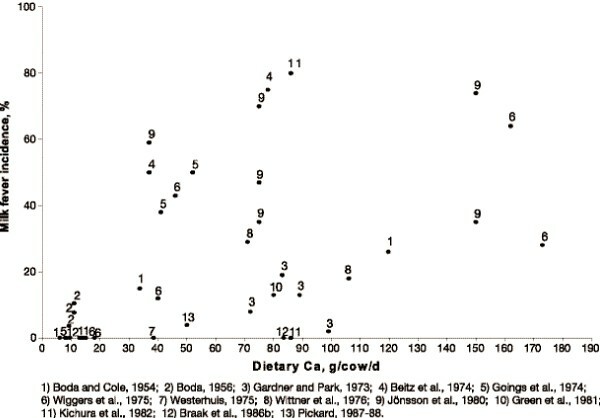 Most authors [30, 69, 10, 79, 7, 76] recommend a high level of daily Ca intake. On the other hand  and  argue that low calcium and a low DCAD supplement each other and they therefore believe such a combination to be superior to the combination high Ca – low DCAD. and  question whether the dietary calcium level has any influence at all on the blood calcium concentration at parturition in cows on an acidifying ration. It is noted, however, that when limestone is used to achieve a high level of dietary calcium, the alkalinising effect of the added calcium carbonate may be a factor of consideration . The use of anions to reduce the DCAD is limited by problems with palatability of the anionic salts most commonly used . It may be added that the rather unnatural acidosis induced by the DCAD principle could possibly also contribute to a reduced feed intake. Several studies have shown a negative effect on the dry matter intake (DMI) when adding anionic salts to the ration [32, 78, 36, 107, 70], whereas others found no effect on DMI [10, 79]. have shown that decreased feed intake and a negative energy balance before calving increase plasma NEFA and concentration of liver triglyceride at calving. This in turn may increase the risk also of displaced abomasum , as well as mastitis, and retained placenta post partum . In order for the cation-anion principle to work, a surplus of absorbable anions must be fed for at least 10 days prepartum to prevent the cow from being alkalinised. A DCAD of -100 meq/kg (calculated as (Na + K) - (Cl + S)) has been recommended . A general disadvantage of this principle is the low palatability of the anionic salts most commonly used. In general, reducing the DCAD by supplementation of anionic salts should only be attempted if the DCAD of the diet is below 250 meq/kg . This principle is based on the theory of preventing the calcium homeostatic mechanisms from becoming quiescent during the dry period. The calcium demand of the dry cow is very limited: 33 g/day per 500 kg body weight in the last 2 months of pregnancy . Most dry cow rations do, however, contain considerably larger amounts. When calcium intake extensively exceeds the requirements, the calcium demand can be met almost entirely by passive diffusion from the intestinal tract, rendering the calcium homeostatic mechanisms relatively inactive [89, 51]. At calving the production of 10 litres of colostrum will result in a loss of 23 g of calcium in a single milking . This sudden and extensive draw on blood calcium must be replaced via increased intestinal calcium absorption and increased resorption of calcium from the bones. The reactivation of the calcium homeostatic mechanisms is, however, time-consuming. A significant increase in calcium absorption from the gut demands 24 h of preceding 1,25(OH)2D stimulation, while a significant increase in bone resorption demands 48 h of PTH stimulation. In milk fever cows, these adaptation processes may take even longer . By feeding low calcium (< 20 g/d) diets in the dry period, the calcium homeostatic mechanisms are activated before calving, and the cow is thus capable of absorbing calcium more efficiently from the intestinal tract as well as drawing calcium from the bone around the time of calving . , however, claimed that diets extremely high as well as low in calcium decreased the incidence of milk fever. The apparent ability of high Ca diets to prevent milk fever has not been explained or documented. The necessary period of exposure in order to obtain good preventive effect from feeding a low-Ca diet transpires from experiments using prepartum feeding periods of 14 days or more [43, 44, 66], whereas  suggested that a low-Ca feeding period of 7 days before calving was too short for prevention of parturient paresis. Fig. 2 is based on the results of 13 studies concerned mainly with the effect of calcium intake in the dry period on the incidence of milk fever. Again the interpretation of the figure must be done with caution, as the experimental conditions of the implicated studies are very diverse. There is, however, a clear tendency towards a very low milk fever incidence following a daily calcium intake below 20 g/d. In contrast, manipulation with the calcium intake above this level will not ensure a low incidence of milk fever. Among the reviewed studies the mean milk fever incidence in cows fed dry cow rations low in calcium (< 20 g/d) is 1.7 per cent, whereas the mean incidence among cows fed rations with a calcium content above 20 g/d is 32.4 per cent (ranging from 0 to 80 per cent). These percentages should not be regarded as the absolute truth, as the experimental conditions of each "group" may vary considerably. The significant difference in milk fever incidence is, however, a clear indication of the effect of keeping the dietary Ca below 20 g/d. Calculating the relative risk (RR) of developing milk fever in each experiment including groups with a daily calcium intake below as well as above 20 g/d results in a mean RR of 0.20 in favour of the low Ca intake. In studies including more than 2 groups, the mean milk fever incidence rate among low Ca (< 20 g/d) versus high Ca (> 20 g/d) groups was used for calculating the RR. Only 6 of the 13 studies operated with groups below as well as above 20 g/d. In 4 of these studies the RR was 0. One study  was omitted because of uncertainty of the interpretation of the results, and in the last study the RR was 1 due to a lack of milk fever in both groups. This study therefore has a large effect on the mean RR, and excluding this study from the calculations would result in a RR of 0. The influence of dietary calcium in the dry period on the incidence of milk fever. Results from 13 studies. The true relative risk is probably to be found somewhere between 0 and 0.20. Because of problems in keeping the calcium intake sufficiently low using commercial available feeds, the low-Ca principle has been more or less abandoned in many countries. However, recent studies attempt to revive the low calcium principle by introducing induced reduced ration calcium availability by the addition of a calcium binder to the ration [64, 109, 63, 110, 119]. The Ca/P ratio has been suggested as another important factor in the development of milk fever. Early studies [12, 103] stressed the importance of keeping the dietary Ca:P ratio low in preventing parturient paresis. It was suggested that a high dietary P suppressed vitamin D hydroxylation in the kidney, thereby indirectly reducing calcium absorption. The reduced intestinal Ca absorption elicited an increase in PTH level, which in turn aided in the prevention of milk fever . on the other hand, stated that the beneficial effect of feeding low Ca diets appeared independent of P. In addition they found that low dietary phosphorus seemed helpful in preventing parturient paresis, when dietary calcium was high. It was suggested that the low dietary phosphorus resulted in an increased formation of 1,25(OH)2D, which in turn increased the efficiency of intestinal absorption of calcium and phosphorus. This viewpoint was supported by  who found that although low dietary phosphorus did not prevent milk fever, the postpartum calcium and phosphorus homeostasis was enhanced, and by  in their epidemiological study of factors predisposing to parturient paresis. As shown above there are many different opinions about the influence of the Ca/P ratio on the incidence of milk fever. In conclusion, the absolute amount of calcium in the diet is probably more important than the Ca/P ratio . The low calcium principle is highly effective, approaching 100%, in preventing milk fever provided the daily calcium intake is kept below 20 g/d, and provided the exposure period includes at least the last 2 weeks before calving. Using commonly available feeds a calcium level of < 20 g/d is difficult to obtain. A possible solution to this problem may be the addition of a calcium binder to the feed. Regarding the influence of the Ca/P ratio, it is concluded that the absolute amount of calcium in the diet is apparently more important. The use of large doses of vitamin D metabolites and analogues for milk fever prevention is controversial. Efficacies vary greatly between studies and the dose required is very close to the toxic dose causing clinical symptoms  including marked anorexia, loss of body weight, dyspnoea, tachycardia, recumbency, torticollis and severe cardiovascular calcifications [46, 98, 81, 87]. The timing of the treatments is very important. Injection given 2–8 days before parturition has been considered optimal. If the cow fails to calve after the 8th day, another injection may be given and repeated every 8 days until calving . For security reasons most producers of these products do, however, not recommend the use of more than 2 doses per cow. Another potential problem in utilizing the vitamin D family of compounds is the risk of hypocalcaemia and clinical signs of milk fever 10–14 days post partum [55, 40]. Among these hypocalcaemic animals the plasma 1.25(OH)2D3 is not increased. The animal is apparently dependent on exogenous 1.25(OH)2D3 to reverse its hypocalcaemia . Despite these drawbacks, vitamin D3 injection has been the most commonly used method of prevention, principally because of its simplicity . Because of the unwanted side effects, and because of an almost total lack of more recent controlled studies dealing with such side effects, production implications and consumer safety, the principle is not described further in this review. Readers are referred to the description given by . Some herds with chronic hypomagnesaemia problems have been known to have very high incidences of milk fever, sometimes approaching 80%–90% of all calvings . Subclinically hypomagnesaemic cows are less able to mobilise calcium in response to hypocalcaemia [21, 95, 16], and chronic hypomagnesaemia can have deleterious effects on calcium homeostasis . More specifically,  found that the resorptive activity of the bones of magnesium deficient cows was significantly depressed, and  found that a slight degree of hypocalcaemia coupled with a greater degree of hypomagnesaemia could lead to clinical signs similar to those of severe periparturient hypocalcaemia. Although magnesium is not directly involved in the aetiology of milk fever, checking of magnesium status should be part of a milk fever control programme since all studies indicate the importance of supplying the periparturient cow with sufficient magnesium to fulfil its needs. The recommended magnesium content of the diet for pregnant dry cows is 0.16% of DM intake . found no improving effect on the calcium metabolism from feeding a high Mg diet (0.37% of DM) compared to a normal Mg diet (0.2% of DM) when the cows were fed acidogenic diets. With regard to Mg administration it is further important not to feed roughage from pastures over-fertilised with potassium, as a high [K+] decreases the uptake of magnesium . Over-conditioned cows at calving have a higher incidence of milk fever  and other diseases postpartum [108, 104, 94]. found that over-conditioned cows (body condition score (BCS) ≥ 4) had a 3.3 times higher risk of contracting milk fever. Accordingly,  found a relatively higher body weight in cows contracting milk fever. The most likely explanation for the increased risk of milk fever in over-conditioned cows is a low calcium intake caused by reduced appetite in the critical period around calving . It is important to prevent the dry cows from being too fat. It is therefore recommended that the energy intake of cows in mid and late lactation is controlled to ensure a BCS of ≤ 3.75. Optimum BCS has been proposed to be 3.25 to 3.75 . However, if over-conditioned, cows in the late dry period should maintain body condition to prevent fatty liver . The influence of concentrate or grain feeding in the dry period was reviewed by . Results of studies concerned with the influence of carbohydrate feeding on the incidence of milk fever are conflicting. found that grain fed at 1% of body weight reduced the incidence of milk fever, and  found an increased risk of milk fever in cows fed rations high in green fodder and calcium but low in cereals. On the other hand  found that a 100% overfeeding with energy (and 80% overfeeding with protein) during the last 8 weeks of pregnancy resulted in an increased incidence of parturient paresis. Accordingly [13, 14] found that overfeeding cows prepartum increased the incidence of milk fever. found no effect of energy intake prepartum. The informations are conflicting. Most authors do, however, believe that feeding large amounts of concentrate in the dry period leads to higher incidences of milk fever. The reason might be that "overfed" cows more easily loose appetite around calving and thereby absorb less calcium than required [4, 14]. Limiting energy intake prepartum will according to  prevent not only parturient paresis but also displaced abomasum. The influence of the length of the dry period on milk fever was reviewed by . Cows with long non-lactating periods are predisposed to becoming excessively fat, since cows do not regulate intake according to their physiological requirements . Besides obesity, a long dry period may result in a more quiescent calcium homeostasis. found a less profound post parturient drop in blood calcium of cows with a mean dry period of 4 days only as compared to a period of 8 weeks. There are, however, some side effects from reducing the length of the dry period. reported a significant reduction in milk production in the subsequent lactation when shortening the dry period from 7 to 4 weeks. Prepartum milking has been found to have no effect on the incidence of milk fever [100, 29, 1], whereas others found a decrease in milk fever incidence following prepartum milking [101, 45]. Most studies on prepartum milking showed no effect on lactation milk yield [101, 121, 45], whereas the effect on retained placenta and udder oedema varies among studies. However, most of these studies are fairly old. In the large study by  it was concluded that prepartum milking can be practiced with no detrimental effects, but as there is no positive effect on lactation milk yield, prepartum milking is unlikely to be justified economically. Shortening of the dry period as well as prepartum milking is unlikely to serve as an option in future herd control programmes, including programmes for milk fever prevention, unless the effect is documented by thorough cost-benefit calculations. Although easy to apply, an effect of reduced milking in early lactation is questionable. and  found no effect of the degree of milking after i.v. calcium treatment on the incidence of milk fever relapses. As no recent studies have been performed on this subject it is not evaluated further in this review. The 3 most frequently used principles in Denmark for preventing milk fever are: Oral calcium drenching around calving, feeding acidifying rations (Dietary cation-anion difference, DCAD) and feeding rations low in calcium. Oral calcium drenching around calving should preferably be done as recommended in the reference studies i.e. 3–4 times for milk fever prevention and 1–2 times for prevention of milk fever relapse. Giving fewer drenches may have some preventive effect, but it is unlikely to reach the effect of the full programme. When using the cation-anion principle it is of crucial importance to feed a surplus of absorbable anions to convert the cow from being alkaline to moderately acidotic. The palatability of the anionic salts most commonly used limit the use of this principle. In general it should not be implemented on rations with a DCAD above 250 meq/kg DM. When using the low-Ca principle, daily calcium intake should be below the requirements of the dry cow. Although difficult to obtain when using commonly available feeds, a daily intake of 20 g/d (or below) is recommended. Unfortunately the above mentioned recommendations are rarely met in practice, resulting in low efficacy measures. Besides palatability problems and difficulty in formulating low-Ca rations, reasons for not following the recommendations may be found in economic considerations and time-consuming single cow handling. These issues have to be thoroughly considered when choosing the method for milk fever prevention on each farm. The preventive principle suitable on one farm is not necessarily suitable on another. Even when applied in the most optimal way the preventive effect of the described principles rarely reaches 100 per cent. Combining one or more of the principles is one potential way of improving efficacy. The low-Ca principle combined with oral calcium drenching around calving could be one option, whereas drenching cows on a negative DCAD ration with oral CaCl2 is discouraged by  due to the risk of inducing an uncompensated metabolic acidosis. Finally, recommendations are conflicting regarding the combined feeding of an acidified ration containing a minimum of calcium. Although not uniquely designed for milk fever prevention certain management measures may be combined with the above-mentioned primary preventive principles. There is only limited information about how the different principles are most efficiently implemented as detailed strategies. It is very much up to the individual farmer or adviser to choose which principle to use. Hopefully, the future will bring more detailed information on the optimal use of control strategies under different farming conditions. Reprints may be obtained from: T. Thilsing-Hansen, The Royal Veterinary and Agricultural University, Dept. of Clinical Studies, Dyrlaegevej 88, DK-1870 Frederiksberg C, Denmark. E-mail: trh@kvl.dk, tel: +45 35 28 28 36, fax: +45 35 28 28 38.